Whether you haul your off-road toy in the back of your truck or on a trailer, securing it safely should always be top of mind. The problem with lower quality tie-downs though, is that no matter how good your intentions are road vibrations and potholes can cause your load to shift making the tie-downs susceptible to becoming loose and untethered. ShockStrap brand of tie-downs addresses this concern head on with an ingenious design that incorporates a secondary urethane elastomer placed in line with the strap that is stretched as you tighten and secure your cargo in place. Key to its design is the dynamic attributes of the urethane elastomer. When tensioned it effectively becomes a spring and damper - all in one. No matter how rough the road conditions get or how much of a side load is placed on your cargo while going through a turn; ShockStraps patented design maintains constant tension as it stretches and compresses in unison with the changing loads being placed on your cargo. Being able to fully support their tagline “Start Strap. 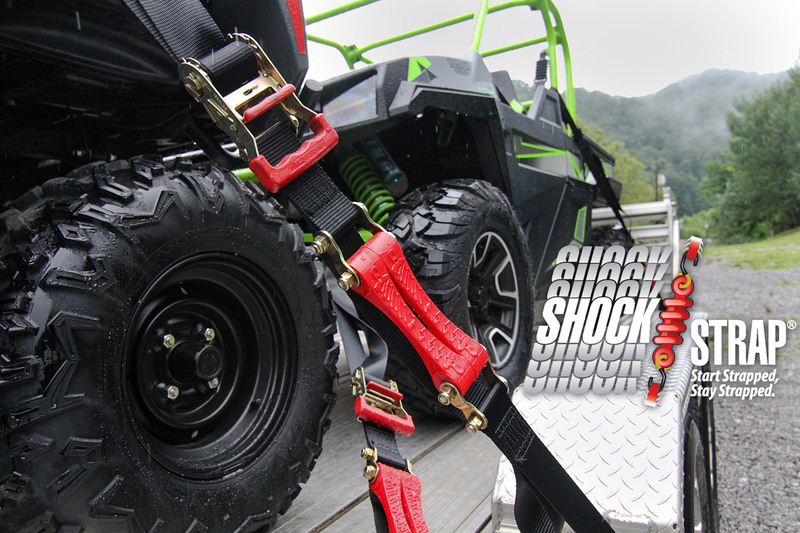 Stay Strapped” is what has given us peace of mind when hauling our ATV’s and Side x Sides. Available in lengths ranging from 6 to 19 feet and widths of 1, 1.5 and 2.0 inch, ShockStraps are not only a smart design they are also really robust. These straps incorporate quality components such as durable polyester webbing that is sewn tight, with integrated soft loops along with a durable yellow zinc chromate finish on the hooks, ratchets, cam locks and grade 8 bolts holding the whole system together. ShockStraps have also been designed in a modular fashion which means you can order parts separately should you ever need to replace individual components. On top of all this ShockStrap also offers a two-year warranty, something unheard of in the market today.